Go for foods that are lower in fat, salt, and sugar. Big meals and traditional treats are a highlight of the season for many people. 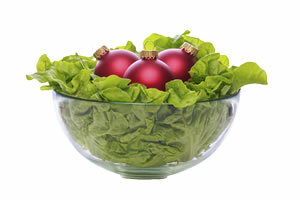 But you don't have to give in to the high calories and excess fat and salt that characterize holiday dining. "Particularly during the holidays, when you are surrounded by foods that you do not eat the rest of the year, it is important to take a breath while deciding what you will and will not include," says Debbie Krivitsky, a registered dietitian at Harvard-affiliated Massachusetts General Hospital. Fatty foods are common on a holiday table. But they're usually high in saturated fat, which raises your risk of high cholesterol, heart disease, stroke, and diabetes. They're high in calories, too. "Fats provide the most concentrated source of calories that we have—nine calories per gram, more than twice as many calories per gram as lean protein and carbohydrates," says Krivitsky. That means you should minimize anything that's buttered, fried, creamy, or cheesy. The usual suspects include sauces and dressings, pies and puddings, and red meats such as marbled roast beef and bacon-wrapped anything. Salty foods are also abundant on a buffet, found in processed meats such as ham and bacon, as well as gravies, soups, crackers, and chips. But too much salt may lead to high blood pressure and put you at risk for stroke. "White" foods (potatoes, pasta, rice, bread) and sugary foods will raise your blood sugar quickly. The flood of insulin that follows can eventually cause blood sugar to drop too far, triggering hunger. Substituting foods that are lower in fat, salt, and sugar will keep you healthier this holiday season. It will also lower your calorie intake significantly, allowing you to enjoy a larger portion for fewer calories. "For example, one ounce of artichoke dip has 19 grams of fat, and 312 calories. In comparison, four ounces of cocktail shrimp, along with one ounce of sauce, provides 130 calories, and two grams of fat," says Krivitsky. What are the best choices on a buffet? Go for salsa, hummus, and dips made with Greek yogurt instead of sour cream. Try lean protein sources such as fish, turkey, fruit, and veggies. Think baked, not fried, and spices, yogurt, or lemon juice instead of sauce. If you can't live without a dab of your favorite foods, don't deprive yourself. But do make healthier versions of holiday favorites. Use low-fat milk instead of cream in mashed potatoes, and low-fat broth in gravy. "Use a fat-skimmer cup, or freeze the juices in a shallow pan so you can remove the fat when making gravy. It saves about 56 grams of fat per cup," says Krivitsky. Applesauce is a great substitute for fat when baking. And if you do give in to temptation completely, Krivitsky says to make sure "it's the exception rather than the rule, and it is for a finite period of time." foods. 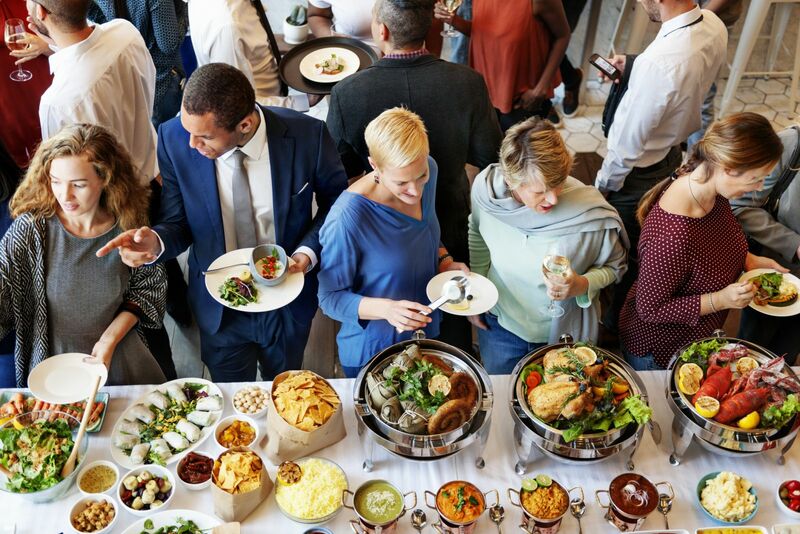 Try these strategies before you head out to holiday parties. Eat before you go. Snack on something light and healthy before you leave home. Otherwise, you may find yourself feeling hungry at a party, which may cause you to overeat. Enlist help. Ask a spouse or friend to help you resist temptation at the buffet table. Talk about it beforehand, so you're on the same page. Police your portions. It really is true that using a smaller plate, such as a salad plate, will keep portions smaller and cut down on calories. Don't go back for seconds. Pace yourself. It takes 20 minutes for your brain to get the message that you're full. Put your fork down in between bites or sip water to slow your pace. Choose carefully. If you must have a taste of something delectable, limit it to just a taste, and don't waste the calories on something you can have any old time (like bread). Limit alcohol. Alcohol adds extra calories and may sabotage your smart-eating intentions. Decide in advance if you'll have one alcoholic drink either before or during a meal, and stick to it. linger at the end of a meal, but it may cause you to keep eating, even if you're no longer hungry.